Line, is an Android chat application on which we can free chat, free call to our friends. You can also send cool looking stickers to your friends. We have shared many free recharge tricks. Please have a look on previous posts. 2. If you have already registered then open Line application and send start sending stickers to group. 3. You will get your first recharge on 5th day of Rs. 30 and it will increase on subsequent days. Maximum amount you can avail is Rs. 120. See below recharge map. #Note: THIS TIME YOU HAVE TO SEND STICKER IN GROUP. SO CREATE A GROUP ADD YOUR FRIENDS IN IT AND DAILY SEND STICKER ON THAT GROUP TILL 20 DAYS TO GET COMPLETE Rs. 120. 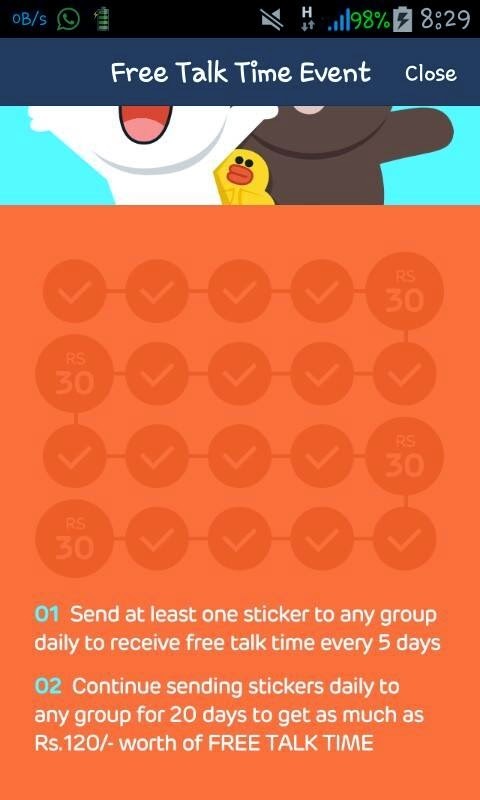 AND YOUR FRIEND SHOULD ALSO HAVE TO SEND STICKER ON SAME GROUP THEN ONLY YOU WILL GET 1 DAY COUNTED. Enjoy free mobile recharge and share this post link with your friends on Facebook, Twitter, Google+, Whatsapp, etc. If you liked this post then please give your time to share it.